Shannon’s large Marley has been found, but Brian is still looking for the smaller 9″ size of this same monkey. I’m looking for a Marley the Monkey (Large size ~18″) sold at Pottery Barn Kids in 2006 in the Critter Plush collection, under item #8013609. This monkey was my son’s lovie since birth, and he’s devastated that it’s missing. It was left at a bagel shop in Auburn, CA a couple weeks ago. We immediately returned to the shop to find that it was gone. The shopkeeper had placed it outside on a table, instead of keeping it in a safe place for us. Thank-you so much for your service. 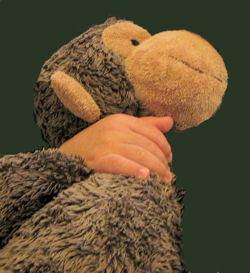 If you can help Shannon find this Large PBK Pottery Barn Kids Marley Monkey, THIS SITE IS NO LONGER ACTIVELY MANAGED. Please use Our FREE FACEBOOK GROUP, including #100708-6 in the subject, . Item number: 300265851330 ebay . is this it? Looks right to me Tami! These marley monkeys recently posted on ebay unfortunately are the small size (11″) and my son’s marley monkey was the large size (18′) so I’ll keep hoping the someone lists a large one on ebay. Thanks for all your help! 300265851330 ebay is supposed to be at least 16 inches per the description. I won the auction on Ebay for the replacement Marley Monkey and my son is very happy to have his “brand new” Marley. Thank-you again for you service. You can now remove this posting.